Like her male counterpart, she's also an Undead who has hollowed appearance, but is not fully hollow. 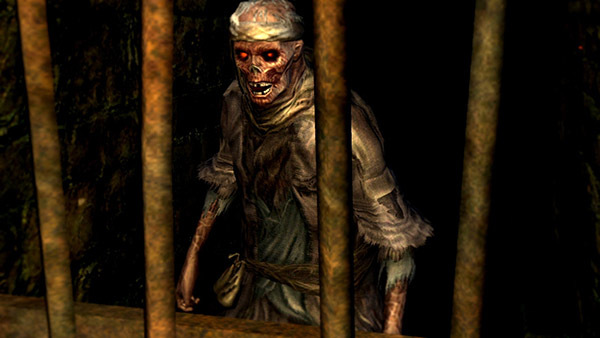 She primarily sells moss she has grown herself behind the iron bars, and some other useful consumables. Once you have the Basement Key you will be able to enter the locked door on the Hellkite Dragon bridge. Go through the door and work your way towards the final tower (opposite the door to The Depths) where a single Hollow archer is up on a platform. The merchant is in the aqueduct tunnel nearby. 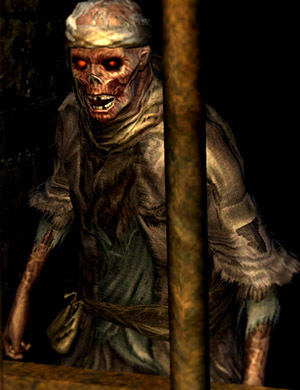 Remember to open up the two shortcuts that make accessing the lower Undead Burg easier; the first is up a staircase by the bottom of the long ladder from the hellkite bridge, the other is in the tunnel with the merchant and provides a quick route to the Firelink Shrine. Hmm, you still have your senses about you? Then why won't you buy some of my moss? Oh, there you are, dearie! Come again, if you please! What a humdrum lad/lass you are. One day, your fate will catch up with you. The Gods above are watching you! Don't you toy with my nerves! What do you thing you're doing?! I have my pride, you damn fool! You think you can get away with murder? Yes, I suppose you think you're special! Well, you're not! You're just another customer! There's no hope for anyone like you! The Gods will not have it! Die a thousand times again!